I have prepared these potatoes from one of my recipe books. 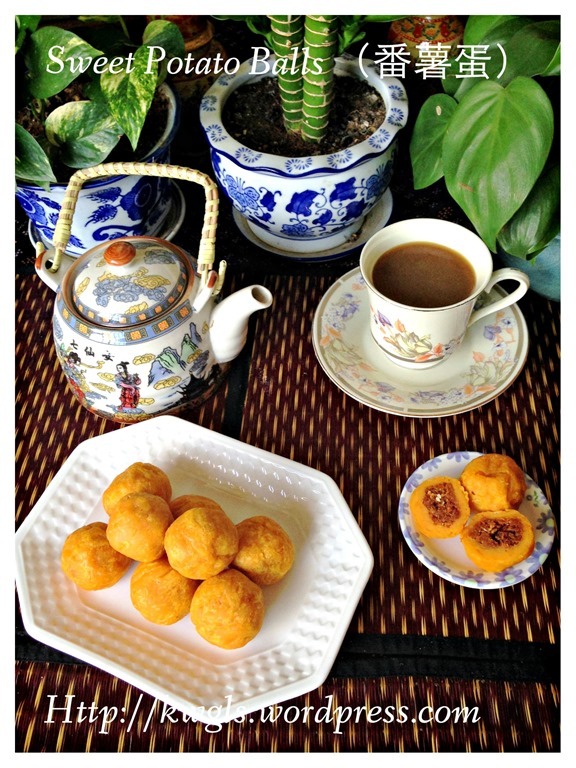 In my recipe book, these were called “Nonya Sweet Potatoes Balls”. 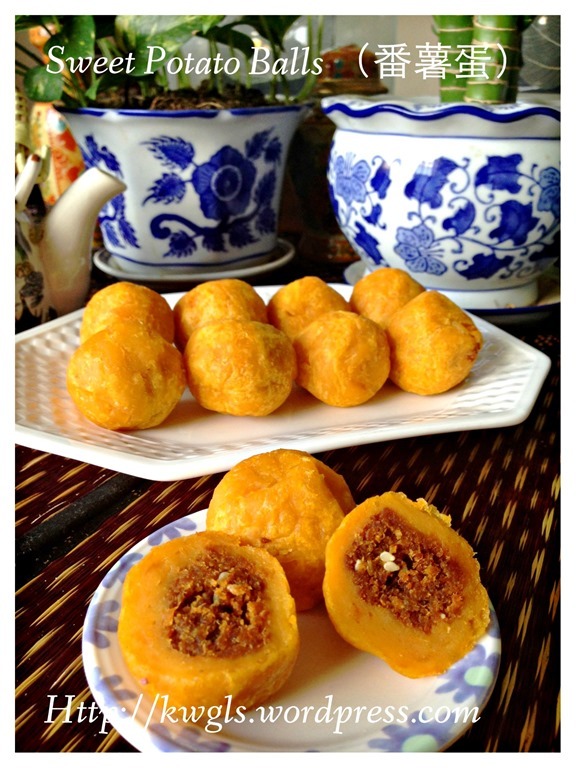 I am very doubtful about whether this is Peranakan cuisines since I have never seen these being sold in Nonya Kuih stalls…. 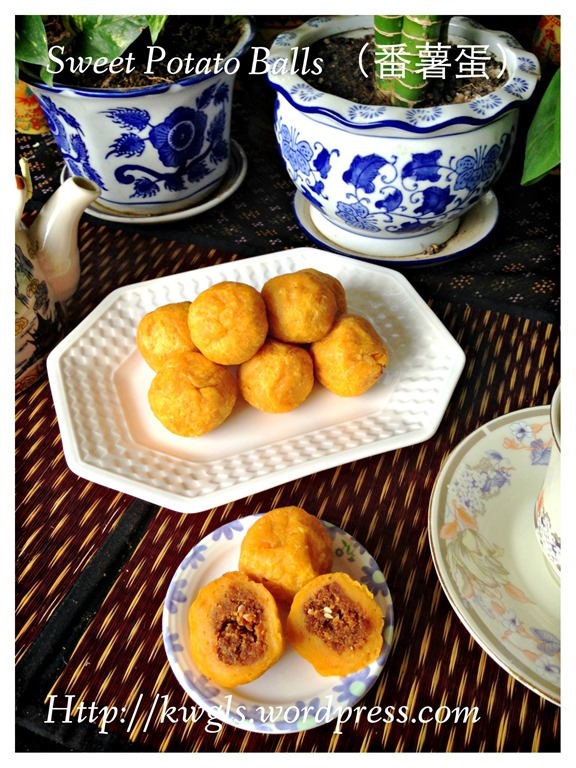 To double confirm, I have posted the images in my personal timeline and a Peranakan Facebook Group. 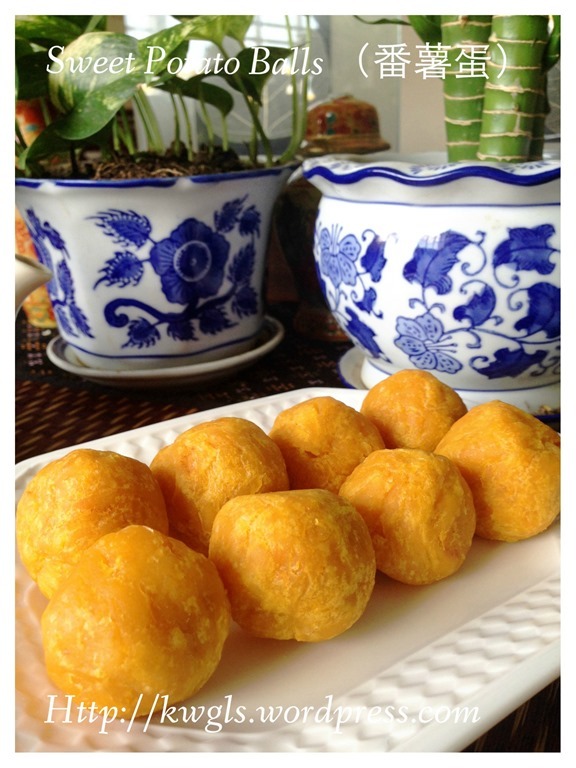 Friends and members of the Group have concluded that this is not a Peranakan cuisine but belong to our Malay brothers called “cucur badak”. 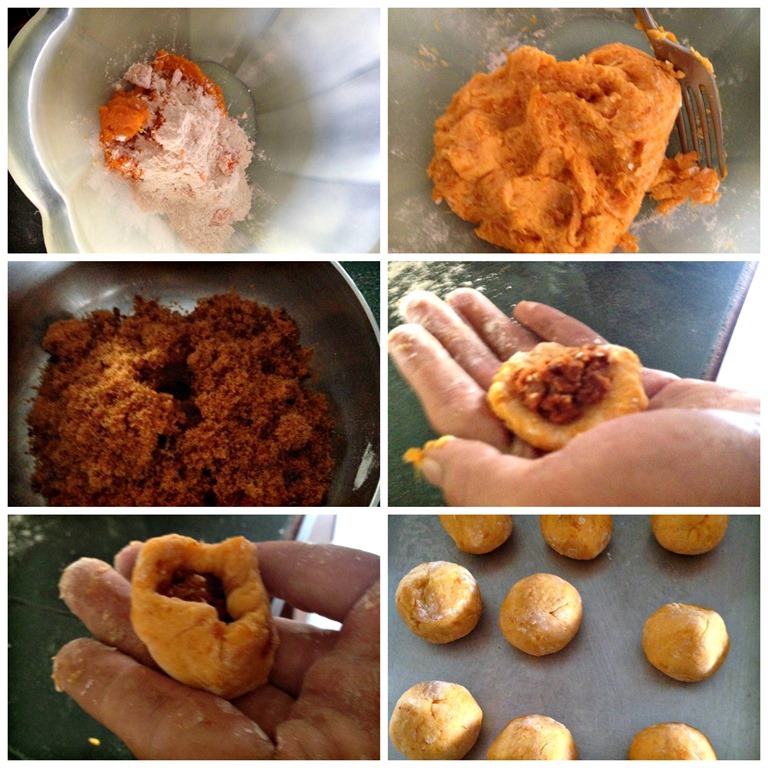 Therefore, in this post I am not going to share the sambal filling that I used and feel free to change to any fillings that you like. 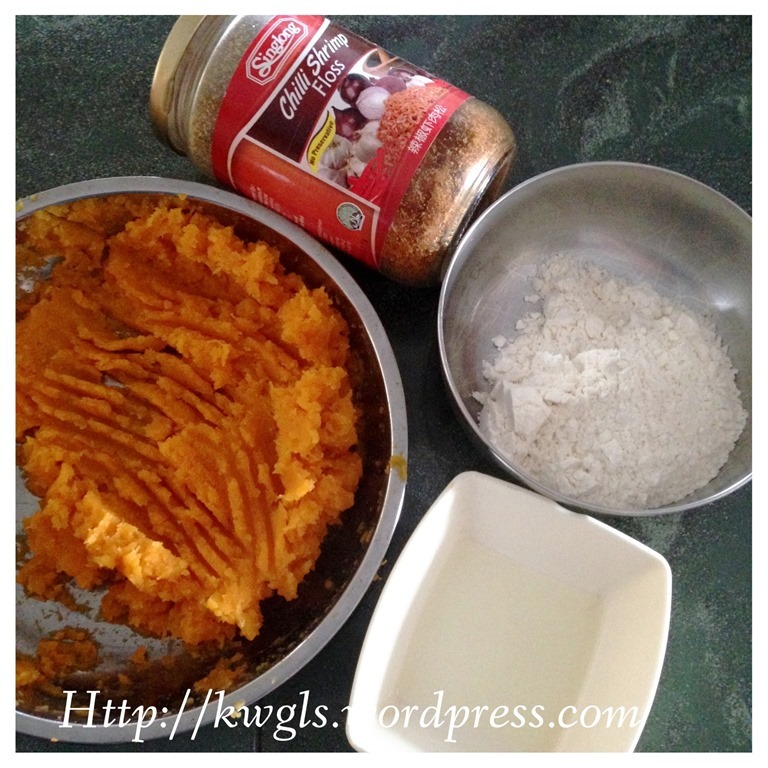 This is an easy recipe and if you like sweet potatoes, you will like this. Singapore do have a stall in Maxwell market that sells these sweet potatoes. But in West Malaysia, I was told that it is commonly available in night markets. *As for the filling, feel free to change to the type of fillings that you like.. 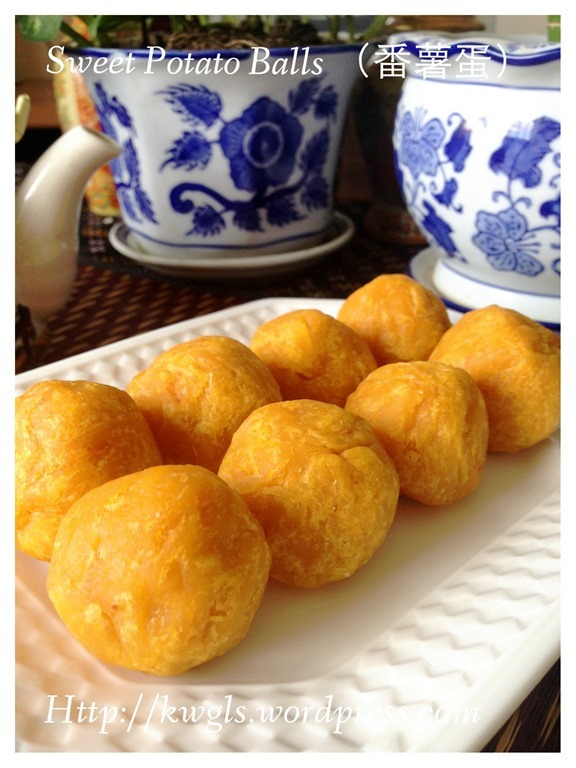 I have used ready made shrimp floss, but you can always use sweet fillings such as mung beans, lotus paste, peanuts etc. 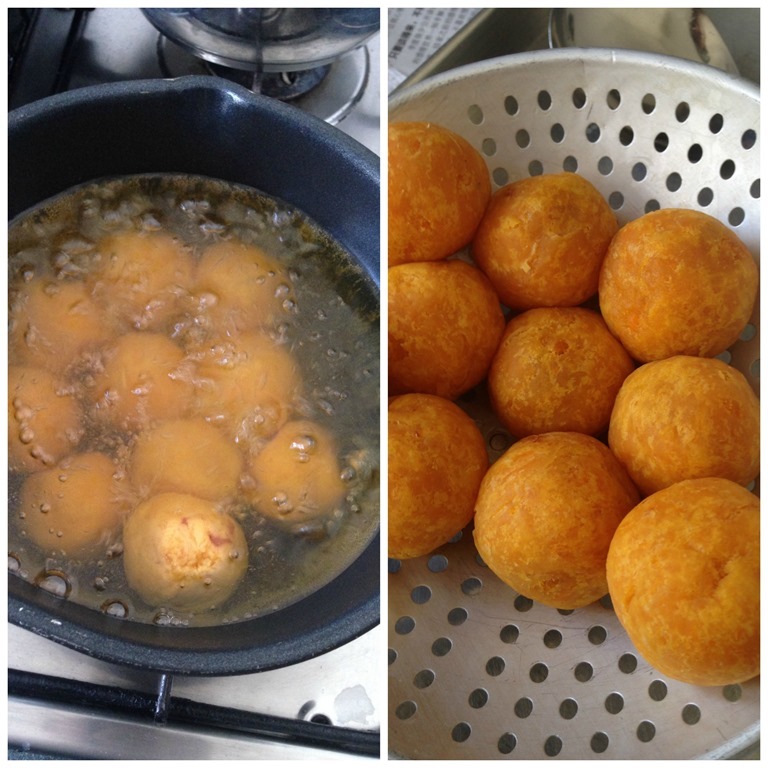 In a mixing bowl, place the mashed potatoes, plain flour, sugar and cooking oil. Use hand to knead until become a pliable dough. Pat your hand with flour if it is too sticky. 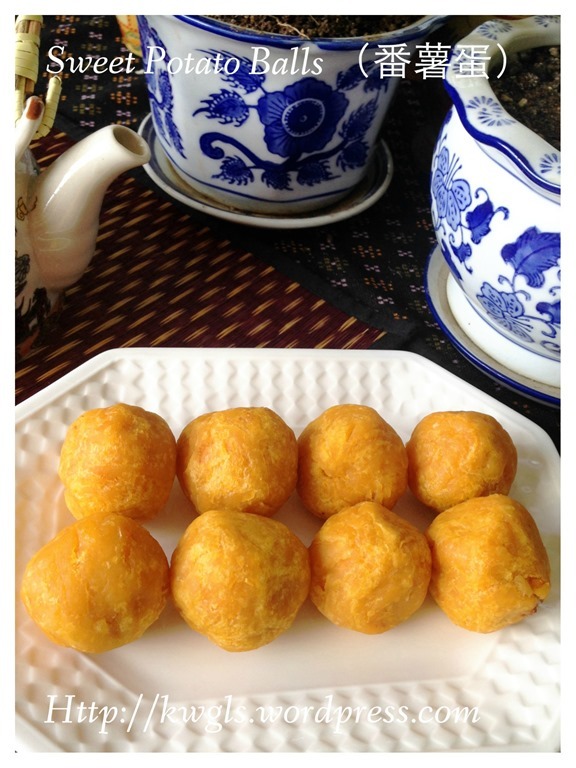 Divide the dough into your desired size (I have prepared 10 balls of about 25 grams each). Take one portion. Shape it into a ball, use hand to flatten, put a tablespoon of fillings on top of the dough, seal the edges, shape it round and set aside. Perform the same for the remaining dough. In a pot, heat up adequate cooking oil. 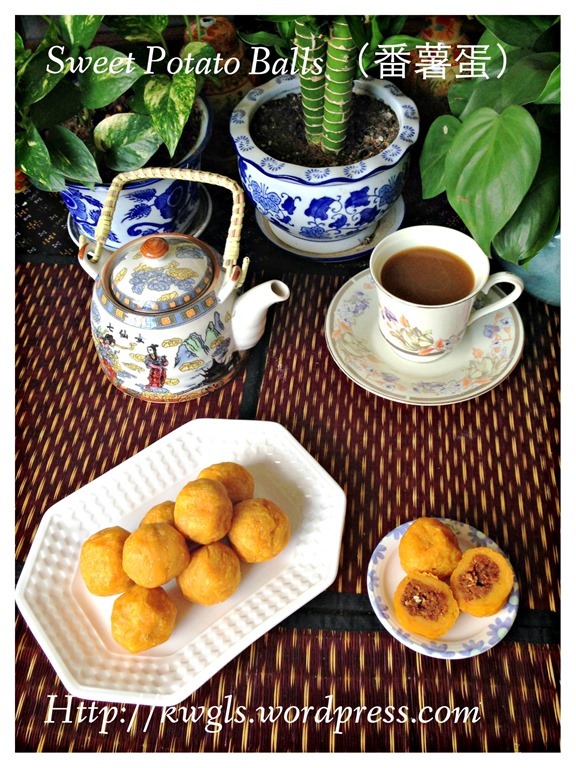 Deep fried the sweet potatoes balls under medium heat until golden brown. Drained and served as a snack or breakfast items. 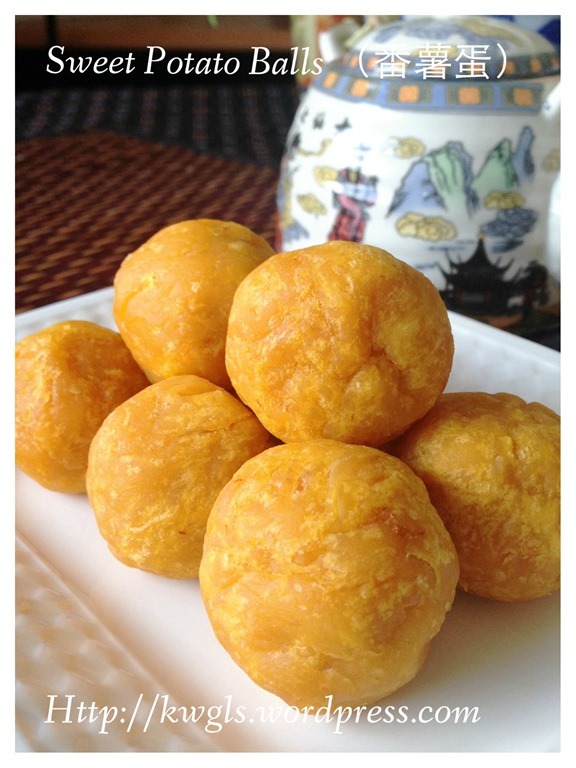 This snack is simple to prepare and you can use any fillings that you like. Do give it a try and see if this suit your taste buds. 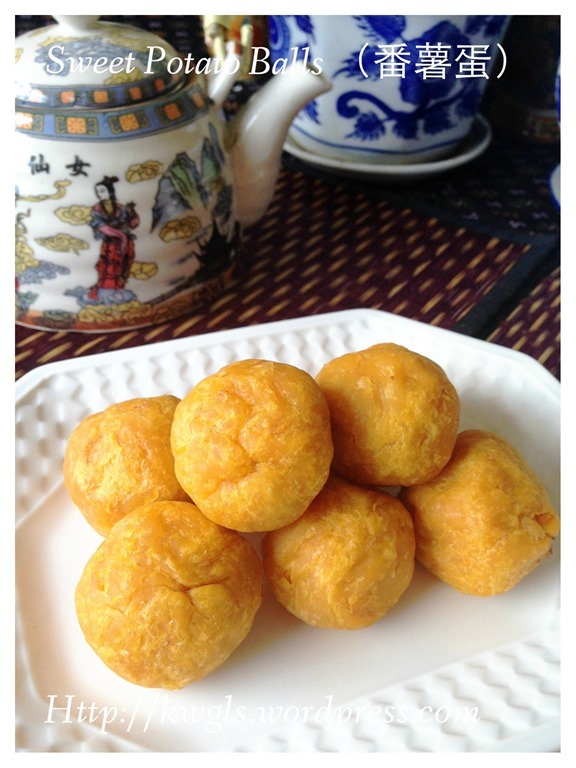 This entry was posted in Chinese and Asian Cakes and Snacks, Food Preparation Series, Party snacks or finger foods, Snacks and tagged cucur badak, 番薯蛋, GUAI SHU SHU, Guaishushu, kenneth goh, postaday, sweet potatoes ball. Bookmark the permalink. 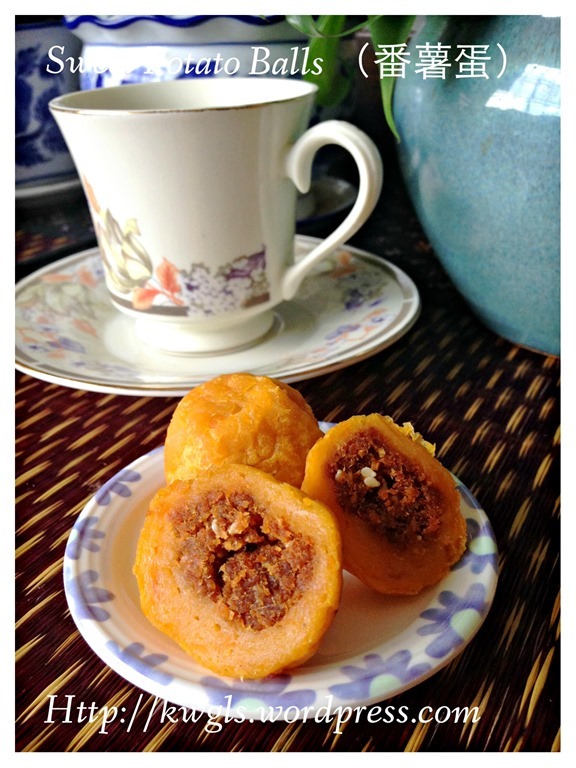 Its call Kueh Badak in Penang. 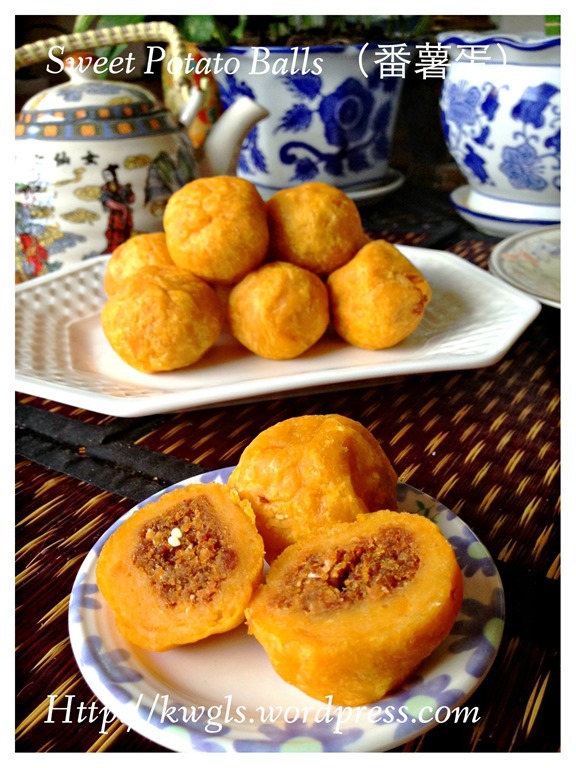 Most kueh stalls do sell this. Some even have a prawn press on top .